Dr. Raez specializes in treating patients with lung, head and neck cancers, and is also the oncology research director of Memorial Healthcare System and the director of the Thoracic Oncology Program. He is active in cancer research and designing phase 1-111 clinical trials with new chemotherapeutic agents and combinations, as well as translational research in the areas of cancer vaccines. He is the clinical associate professor of medicine at Florida International University and is visiting professor of medicine at Cayetano Heredia University in Peru. He is also an affiliate associate professor of clinical biomedical science for Florida Atlantic University. 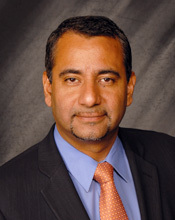 Dr. Raez is board certified in internal medicine and medical oncology and board eligible in hematology. He is a member and serves on several committees with: AACR, ESMO, ASCO, IASLC, ALLIANCE, NCCTG, ACCP, ACP, ACSG, SLACOM, FLASCO among other institutions.